"The manuscript is a witness to the original Greek text of the Gospels and to its use in medieval times in the Byzantine Empire..." -Professor Antonopoulou with the university's department of philology. 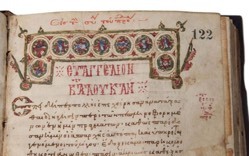 The text, which is called "Manuscript 18," will be on display in the museum before being returned to the university. It was written in Greek and contains four canonical Gospelscopied by a monk in the 1100s. The Museum of the Bible and the University of Athens have agreed to display the manuscript at a temporary exhibit that runs through Oct. 1 in Washington DC. The museum will also post images of the text on its website so anyone can study it. "For several years, Museum of the Bible has been undergoing an intensive review of all holdings in its collection and items on loan from more than 40 lending institutions and collectors from around the world," said Museum of the Bible Chief Curatorial Officer Jeffrey Kloha, Ph.D. "With the assistance of Thomas R. Kline, an attorney with Cultural Heritage Partners whom we engaged in 2017, our staff have painstakingly researched some 3,200 objects and artifacts in our collection and on exhibit at the museum. Our intent has been to verify the provenance of these items and confirm they meet our acquisition policies and museum association guidelines. If not, we follow cultural heritage practices and, in a case like this, return them to the owner so they can be cared for and studied in their original setting." Subscribe for free to Breaking Christian News here.